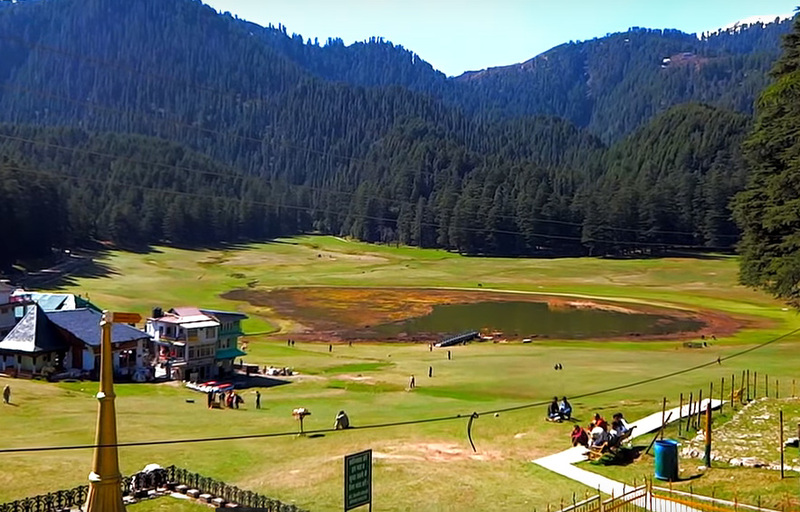 Khajjiar is one of the most beautiful travel destinations in Himachal Pradesh which is somewhat untouched by the crowd of travellers from across the world. This serene hill station in Himachal Pradesh has all to potential to become one of the most romantic adventure travel destinations for people of all ages. The lush green scenic beauty and the green forests surrounding this place makes it a real treat for the eyes. Khajjiar is for the nine-hole golf-course which is nestled in the midst of lush greenery and an amazing landscape. Khajjiar is indeed a small plateau and has a small lake which is one of the most popular tourist spots in this town. Surrounded by green meadows and dense forests, Khajjiar is also known for its beautiful temples. Due to its unique beauty and similarities with Switzerland, Khajjiar is also known as the “Mini Switzerland of India”. Khajjiar is situated in Chamba district and is 24 Km from Chamba Town. Surrounded by thick forest of deodar, its area is around 1 sq km. In the centre of the plateau there is also a small lake. Khajjiar is also known by the nickname “the Gulmarg of Himachal Pradesh” and serves as the starting point for trekking adventure trips to Chamba, Dalhousie and Kalatop Wildlife Sanctuary among others. The typical geographical features of Khajjiar makes is one of the best adventure destinations in Himachal Pradesh and trekking is the most popular adventure activity and the best way to explore Khajjiar. In winter, temperature can lover just above freezing point when heavy woolens are required. During summer, the climate is mild and light woolens/cottons are recommended. By Rail : The nearest rail head is at Pathankot and it is 120Km. place. But now days the airflights are suspended. Lake : In the centre of the glade, is a small lake fed by sreams that traverse the green carpet. Khajjinag Temple : This temple is of 12 century and is dedicated to the the Khajjinag. In this temple there are lifesize wooden images of the five heros of Mahabharat, the Pandava brothers. This entry was posted in Khajjiar and tagged khajjiar adventure travel, Khajjiar himachal pradesh, khajjiar offbeat, Khajjiar travel. Bookmark the permalink.